Why Should Clinical Trials Include More Diverse Populations? Two recent studies showed that the neuropathology of Alzheimer's disease and outcomes were different among black and Hispanic patients compared with whites. These differences underscore the need to ensure greater inclusion of heterogeneous populations in clinical trials, several trialists agreed. Most of what researchers know about Alzheimer's disease (AD) has been based on studies of mostly white populations, one leading researcher told Neurology Today, in response to the question: Should clinical studies be required to include more heterogeneous populations? Two papers published online in February in two different Alzheimer's disease journals offer that case in point. In one, a retrospective study of the Florida Autopsied Multi-Ethnic (FLAME) cohort published in the February 18 online edition of Alzheimer's Disease and Dementia, investigators reported that Hispanics had an earlier onset and longer duration of Alzheimer's disease than either African-Americans or non-Hispanic whites. In the other, published online February 11 in the Journal of Alzheimer's Disease, Hispanic and African-American decedents were more likely than non-Hispanic whites with dementia to show neuropathology suggestive of cerebrovascular disease as well as Alzheimer's disease brain changes. The study included 35 deceased African-Americans, 28 Hispanics, and 360 non-Hispanic whites. “Because Hispanics and African-Americans are at greater risk of developing the disease (1.5 times and two times respectively) than non-Hispanic whites, we were surprised that Hispanics appear to withstand the disease longer than both non-Hispanic whites and African Americans,” said the lead investigator of the FLAME cohort study, Melissa Murray, PhD, assistant professor of neuroscience at Mayo Clinic in Jacksonville, FL. This raises the question of whether Hispanics have protective factors that enable them to withstand the disease longer, such as unknown neurobiologic factors or enhanced socialization within tight family networks, said Dr. Murray. “Although these post-mortem studies were limited by small sample sizes of Hispanics and African-Americans and by convenience sampling, they represent an important step toward understanding the similarities and differences in the neuropathology of dementia in patients from different ethnoracial backgrounds,” said Dr. Mungas. For example, he said, studies have shown that apolipoprotein E4 (APOE4), which is the strongest genetic risk factor for Alzheimer's, may not carry the same risk for the disease in Hispanics as it does in whites. Indeed, “population-based research comparing Mexican-Americans to whites with Alzheimer's in north Texas, showed that they had a lower presence of APOE4 but an earlier onset of Alzheimer's disease and mild cognitive impairment,” said Sid O'Bryant, PhD, professor of pharmacology and neuroscience and executive director at the Institute for Translational Research at the University of North Texas Health Sciences Center in Fort Worth. Dr. O'Bryant was a coauthor of the study published in 2013 in The Journal of Alzheimer's Disease. “How is that possible if the primary genetic risk factor is less common? This underscores that the presence of APOE4 varies by racial groups. If we don't know the biological risk factors for Alzheimer's across diverse groups, then we can't create appropriate therapies,” said Dr. O'Bryant. Dr. O'Bryant is the lead investigator of a five-year National Institute on Aging-funded study that is examining how biological mechanisms are impacted by health disparities—such as higher rates of depression and diabetes—among Mexican-Americans. Previous research has shown that Mexican-Americans have a more metabolically driven profile than whites, which may be related to diabetes. “We know that diabetes is a risk factor for late-life Alzheimer's and may be a more prominent driver of memory loss during the aging process among Mexican-Americans,” said Dr. O'Bryant. “The value of inclusion is it will enable us to understand more broadly how this disease impacts populations believed to be at greater risk,” said Lisa L. Barnes, PhD, the Alla V. and Solomon Jesmer Professor of Gerontology and Geriatric Medicine at the Rush Alzheimer's Disease Center in Chicago. Otherwise, it's possible to draw the wrong conclusions about causes and treatment, said Dr. Barnes. For example, her 2015 study in Neurology found that African-Americans were much more likely to have mixed disease pathology than whites, which she explained can include infarcts, Lewy bodies and TDP-43, in addition to plaques and tangles. However, because African-Americans tend to have more vascular disease, “we expected to see more infarcts mixed with Alzheimer's changes. Instead, we found more Alzheimer's pathology mixed with Lewy bodies, the pathology associated with Lewy Body disease,” said Dr. Barnes. From the diagnostic perspective, it is urgent to test the framework for diagnosing Alzheimer's disease based solely on measures of plaques and tangles, William T. Hu, MD, PhD, associate professor of neurology at Emory University School of Medicine in Atlanta, told Neurology Today. “In our work, we found differences in key spinal fluid Alzheimer's biomarkers between African-Americans and whites that could lead to the disease being under-diagnosed in African-Americans. We need more studies involving diverse populations to understand how this standard model of Alzheimer's applies to a broader population,” said Dr. Hu. Although whites tend to perform better than other ethnic groups on cognitive tests it doesn't mean they have healthier brains. “Brain variables account for at most 50 percent of the variance in test scores. Other factors such as educational and life experiences contribute to test scores. The challenge is to separate effects of the brain diseases on test results from the non-brain effects. This can be done in a single cross-sectional evaluation by employing good normative data that allows the neuropsychologist to compare the observed test scores with what would be expected based upon the demographic features of each individual,” said Dr. Mungas. To correct that, Dr. O'Bryant and his colleagues have developed cultural and linguistically appropriate normative references for Mexican-Americans. In the Texas Mexican American Normative Studies, his group generated education- and age-adjusted normative scores for commonly utilized neuropsychological instruments, such as the Repeatable Battery for the Assessment of Neuropsychological Status and Wechsler Memory Scale Logical Memory. She encouraged researchers to think of diversity beyond solely race and ethnicity to include people from different socioeconomic levels, rural areas, and LGBTQ communities. Other researchers noted that it may be impractical to recruit minority participants if scientists live in racially homogenous areas. “I prefer guidance about what is needed and how to get there. For example, providing resources and collaboration opportunities with scientists who are recruiting diverse ethnic groups from their communities instead of neurology clinics, which is current practice,” said Dr. O'Bryant. Moreover, institutions with peer-reviewed grants should be stricter about requiring investigators to recruit minorities, especially upon grant renewal. “If they have been notified and given recruitment guidance and still not actively recruited minorities, their grant should be terminated,” said Dr. O'Bryant. Despite rapid progress, there are still a lot of unanswered questions as to why minority populations appear to be at greater risk, Dr. Barnes. Among those questions, she said, are these: Are biomarkers for the disease the same across different populations? Do risk factors operate the same across different populations? And are the pathologic changes associated with the disease the same or different across populations? It will also be important to understand how the pathologic markers of the disease develop in people without the clinical signs of dementia, “like we do in our studies where we follow the elderly (who initially enroll without dementia) over time until death and we measure genetics, lifestyle factors, and other characteristics while they are living and then correlate those findings with what we see in their brains postmortem,” said Dr. Barnes. He noted that this study will have relatively large numbers of autopsies from individuals from different ethnoracial groups in comparison with studies to date, and all cases will be drawn from a defined population of older individuals who receive their health care through Kaiser Permanente. “Prospective longitudinal studies are occurring in different regions of US, but the challenge is applying a deep dive (i.e., more detailed biomarker analysis than just clinical diagnosis) reflecting the current biological understanding of Alzheimer's disease to all these cohorts,” said Dr. Hu. “For example, conducting research with serial non-standard MRIs or fluid biomarker measurements with matching genetic information in large pools of people is not easy to operationalize. However, we need to first have small cohorts for the deep dive and then a larger cohort to validate promising findings from the smaller cohorts,” said Dr. Hu. Drs. Mungas, Murray, Barnes, and Hu had no competing interests. •. Santos OA, Pedraza O, Lucas JA, et al Ethnoracial differences in Alzheimer's disease from the Florida Autopsied Multi-Ethnic (FLAME) cohort https://www.sciencedirect.com/science/article/pii/S1552526018336306. Alzheimers Dement 2019; Epub 2019 Feb 18. •. Filshtein TJ, Dugger BN, Jin LW, et al Neuropathological diagnoses of demented Hispanic, Black, and non-Hispanic white decedents seen at an Alzheimer's Disease Center https://content.iospress.com/articles/journal-of-alzheimers-disease/jad180992. J Alzheimers Dis 2019; Epub 2019 Feb 11. •. O'Bryant SE, Johnson L, Balldin V, et al Characterization of Mexican Americans with mild cognitive impairment and Alzheimer's disease https://content.iospress.com/articles/journal-of-alzheimers-disease/jad121420. J Alzheimers Dis 2013;33(2):373–379. •. Barnes LL, Leurgans S, Aggarwal NT, et al Mixed pathology is more likely in black than white decedents with Alzheimer dementia https://n.neurology.org/content/85/6/528.long; Neurology 2015; 85(6):528–534. •. Howell JC, Watts KD, Parker MW, et al Race modifies the relationship between cognition and Alzheimer's disease cerebrospinal fluid biomarkers https://alzres.biomedcentral.com/articles/10.1186/s13195-017-0315-1. Alzheimers Res Ther 2017; 9(1): 88. 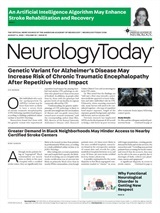 Neurology Today19(7):6-7, April 4, 2019.